Don’t imagine how to walk with your three four-legged at the same time? Be sure that our three dogs leash "Inseparable Friends" will cope with this task easily. A 3 dog walking leash is designed for three small or medium dogs and provides maximum comfort while walking. Triple coupler dog leads "Inseparable Friends" are made of high-quality dog-friendly leather, sewn with reinforced thread. 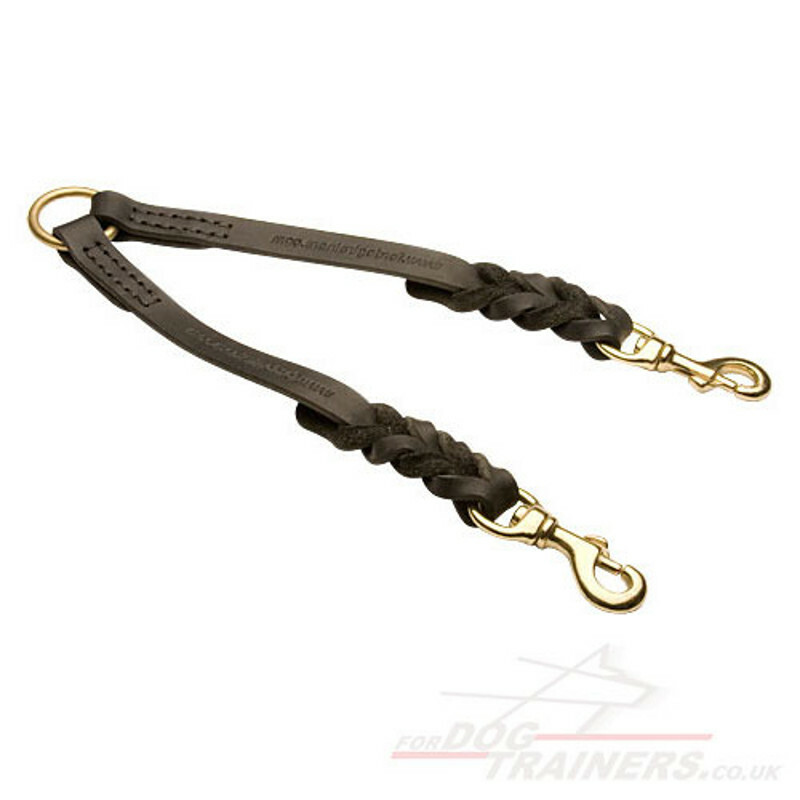 A professional triple dog lead is equipped with 6 brass snap hooks and a brass O-ring to which a dog leash is attached. Each leash has two snap hooks on both ends and it allows to unfasten or extend it for more freedom of dogs. Brass snap hooks rotate that protects leashes from entangling. A multifunctional triple dog lead UK is a practical dog accessory for controlling your three dogs’ behavior simultaneously, visiting a vet, dog shows, travelling, jogging. Do not hesitate! Get a durable triple dog lead at the affordable price from the producer directly! We use genuine full grain leather only. It is thick, soft, flexible and strong to undergo huge jerky loads of large dog breeds. ForDogTrainers use rustproof brass for the hardware of these dog leashes. Brass fittings are reliable and glossy. The design of a triple dog lead allows you to unfasten any leash providing more freedom for your doggy. Brass snap hooks rotate that protects dog leashes from entangling. Suitable for small and middle dogs. All materials and leather are selected according to the International Standards of Quality. Rustproof brass hardware and strong leather of a triple dog lead make it long-lasting and tear-proof. Q: What Dog Lead to Buy? Q: What Length Should a Dog Leash Be? Enjoy walking with your lovely dogs nearby! Try this comfortable dog lead coupler! Start controlling your two dogs at the same time! This leather dog lead is handmade with love and care for your lovelydog.